I know some people reading might think I'm crazy, but I have missed doing yard work! Somewhere in all those childhood years of getting up at 6 am to work in the garden I grew to love it. There were always some aspects I loved - planting seeds was one of them. I remember looking at the seeds, fascinated that something so small could turn into a carrot or a beautiful flower. And, of course, eating what came from the garden was definitely enjoyable. 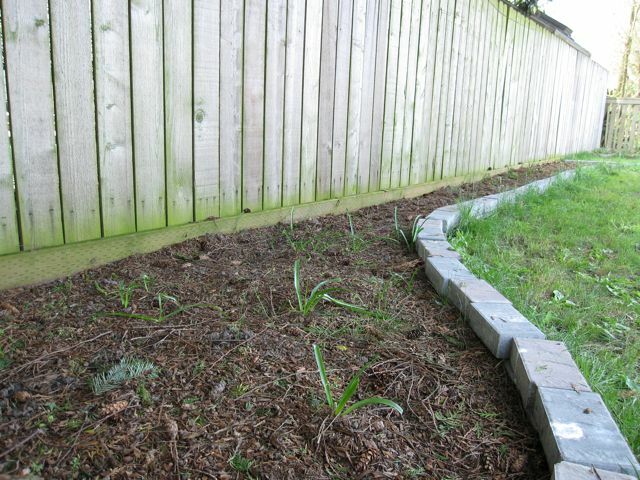 Anyway, I haven't been able to do any of that yet, but I have had a chance to mow the lawn (it needed a couple of mowings since it hadn't been touched since the owners moved out, so for about 9 months), weed the existing beds, and start hacking at the pampas grass out front. You might not be able to see so well in this picture, but our grass is now an acceptable length, except along the edges. 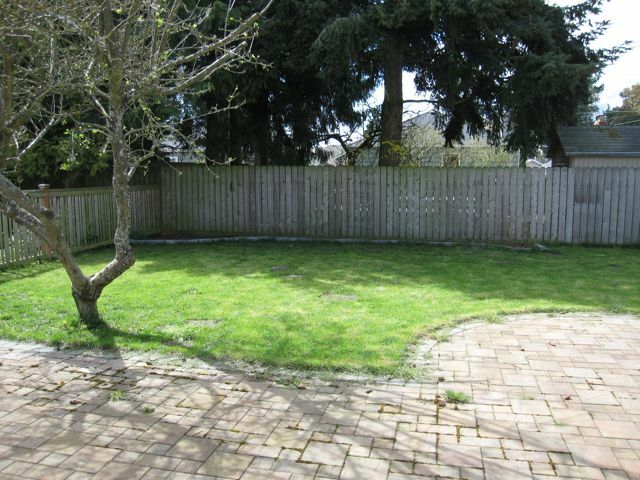 I'm not willing to fork out the money for a weed-wacker, so I'll have to get some clippers or something to trim around the edge of the yard. And I know the beds don't look super-clean, but that's because of the pine trees. I guess I'm just going to have to get used to them being full of pine cones and needles because otherwise I'd spend half my life out there trying to clean them out. Notice that one of the pictures has visible shadows in it. This is a rare occurrence in Seattle. I'm not bitter. Do I sound bitter? That thing is definitely a weed. Enjoy soft Seattle grass. You can get some velvety soft kinds that won't grow most other places! 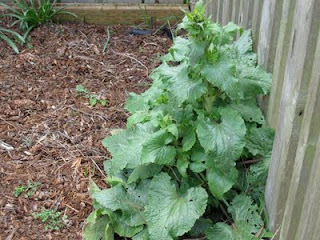 I think that is a Hollyhock plant. They grow super tall and have flowers quite a way down the stem. I think they are beautiful! 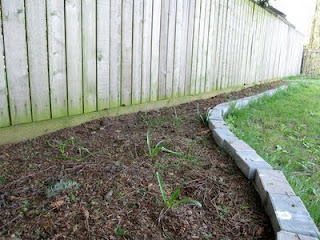 Don't pull it up yet - it will get much taller before it starts flowering. I LOVE working in our yard, the excitement of finally having one still hasn't worn off for us yet, although it was a bit dampened during the flooding last year... I'm really looking forward to our garden again this year! According to my Ecology professor, there is no such thing as a "weed." We use the term to describe a plant that is not desirable in that particular location. If you like it, keep it! :) I wish I had more of a green thumb, I tend to not do so well with plants I get. Well, he's correct. But there are some things that most people would never intentionally plant and that are generally agreed upon as being undesirable and vice versa. I just want to know if this plant falls in either of those categories. hey I guess I could send you an email, but this seemed faster at the time... I just wanted to say thanks for your comment on my blog about how you don't have to wait on the man - go get em! That's actually what I did with Devin, he just wasn't asking me out, and it finally drove me crazy. But I completely forgot to put it in, so thanks for the comment, because I am all for women who step up in their lives! !